The Sydney Opera House is one of the most distinct and iconic buildings in the world. Completed in 1973, the building is well-known as a monument to Expressionist architecture as well as the home of several world-class performances. 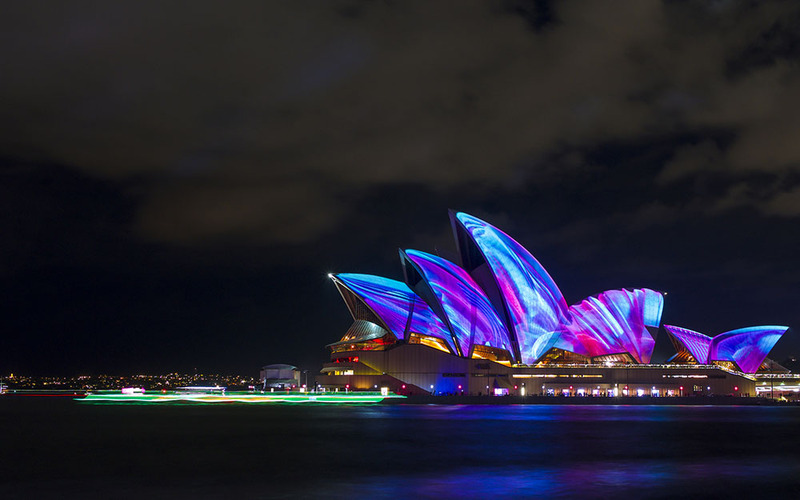 The design of the Sydney Opera House — namely, the large shells that make up the roof of the structure — make it an excellent showcase of what 3D projection mapping is capable of. At night, the opera house is frequently lit up with a variety of colors and patterns, courtesy of an outstanding projection mapping crew. While you might not be scheduling your next conference or company event at the Sydney Opera House, there are still plenty of creative ways you can use 3D projection mapping. One way to make a great first impression is to use video projection mapping to play a welcome video on one of the exterior walls where your guests will enter the building. The video can be something simple — such as an animated logo or message — or you can develop a more detailed introduction video for guests to watch as they enter. When developing a video to play on the exterior wall, try to incorporate any unique shapes or characteristics of the building into the video itself. This will add to an already attention-grabbing effect. Is there an interesting sculpture or architectural quirk inside the building? Highlight it with a vibrant 3D projection! Adding colorful flair to elements in the building is a great way to spruce up and leverage the event space without buying or renting expensive decorations or artwork. If there aren’t any interesting sculptures or architecture inside the building (and even if there are), you can still use 3D projection mapping as a portable alternative to bringing your own art and decorations. In general, 3D projection equipment will take up less space than a full room of decorations, and you can alter the projections for each event on the schedule. Whether the ceiling is a boring color or has an interesting architectural design, adding projection mapping can be a great way to distinguish the room and more fully incorporate any thematic elements you’ve decided to use for your event. One advantage of 3D projection mapping is that it is designed for almost any type of surface. This means it can be used in lieu of a regular white projection screen during general sessions, keynote speakers, or any other time a speaker is on stage. Using projection mapping eliminates the need for a projection screen, which means the stage will have a larger and more open feel to it, and could even give the speaker more room to move around. In addition to those benefits, projection mapping typically allows for a much larger screen area, which means you can have a larger number of images or text visible to the audience at the same time. These are just a few examples of how you can use projection mapping at your next event. Next week, we are going to highlight some of the most impressive uses of 3D projection mapping we’ve seen so you can get even more inspiration! ImageAV is a nationally recognized AV company with nearly three decades of experience helping customers run successful and memorable events. Contact ImageAV today to find out what it’s like to work with a professional and experienced AV team.